Three-day weekends are one of the best things i like in life. Although it would always seem to go by fast ~ still, I like it. It was so hot memorial weekend but it was so fun still! Remember I mentioned in my recent posts that my son turned 4 years old already and that we are having a party over the weekend. So we did! It was a birthday party & a house blessing in one. 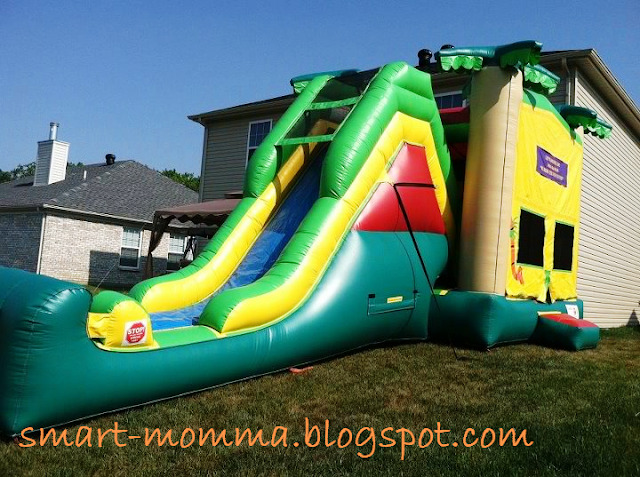 We rented an inflatable house ~ my son & my daughter had a blast!! not to mention my husband & myself were bouncing and sliding more than the kids did!! Sunday night - bbquing at my sister-in-law's house with family & friends ~ kids playing at the backyard while moms & dads are eating & drinking a little bit. Monday - kids went for a swim at a friend's pool in their apartment complex. Good food, good times & kids are having sooo much fun! What about your weekend, how did it go? Bland to Fab Box Update: Where Is It Now? Organizing Home-Office Drawers - 1st drawer done! What Do You Think of My Entryway?